The HELP Project consortium is designing a Health Monitoring System specifically targeted for the needs of Parkinson Disease (PD) patients. Without treatment, PD progresses over 5–10 years to a rigid, a kinetic state in which patients are incapable of caring for themselves. Death frequently results from complications of immobility, including aspiration pneumonia or pulmonary embolism. The availability of effective pharmacological treatment has altered radically the prognosis of PD; in most cases, good functional mobility can be maintained for many years, and the life expectancy increased substantially. Primarily, therapies are aimed at minimizing symptoms and maximizing function and quality of life. A remote Point-of-Care unit to supervise the patients under clinical specialists control. The HELP project intends to provide Parkinson Patients with a system that can supply specific amounts of drug according to their physical activity requirements at any moment. Because it is a continuous drug delivery system, drug peaks and “valleys” in the blood stream are avoided and so improving classical PD symptoms. 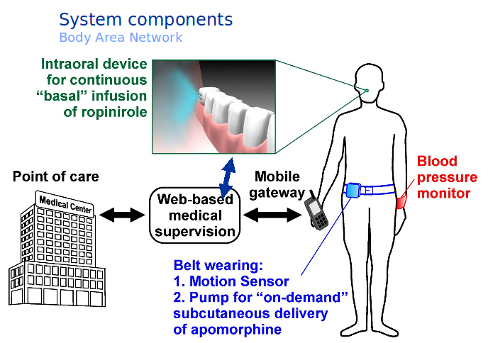 The HELP system is made up of a wearable subcutaneous pump, a intraoral cartridge inserted in patients’ mouth, a wearable movement sensor, blood pressure device and a control system that is constantly sending data, checking the patient and calculating the right quantity of drug to be supplied. 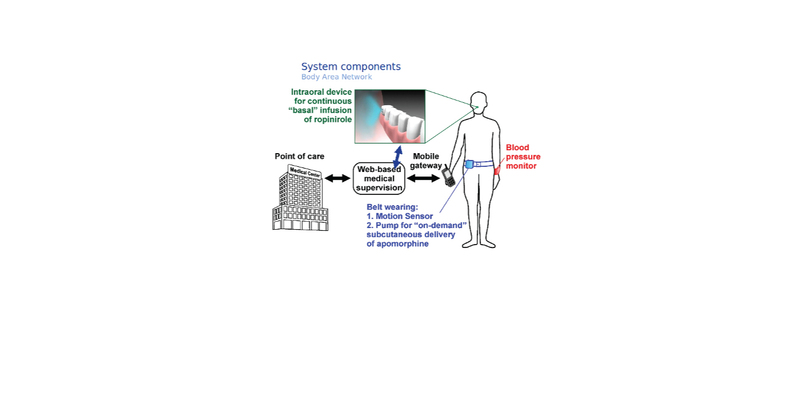 This project intends to provide a proof that a monitoring drug delivery system can improve the quality of live of Parkinson patients. We want to test whether this system is seen like an improvement in the three different countries we are setting pilots. Because this consortium is very targeted on the eHealth market, each of the partners is very interested in whether commercialize or improve their prototypes its services and devices or testing a specific drug that we are using in HELP.